The Golden Palms Hotel and Spa sits on the grandeur of Moorish-Spanish casitas and the entire place is steeped in luxury. 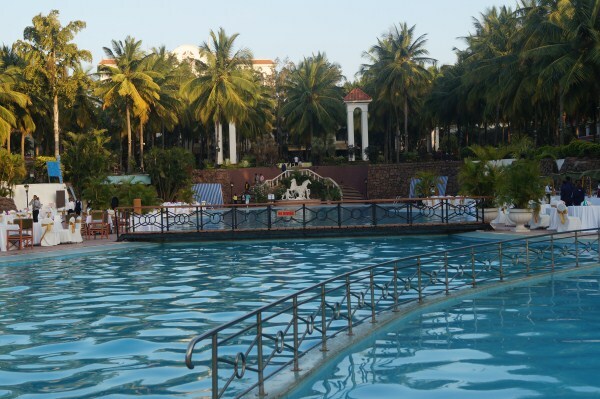 The resort, built wonderfully and landscaped neatly, lies nestled among 14 acres of foliage, sprawling lawns, waterfalls and lagoons creating a perfect atmosphere for its many visitors. The resort houses 132 deluxe rooms, two presidential suites, a 75,000 square feet spa building and themed restaurants and bars. Guests can relax near the 135-meter freestyle swimming pool, and sports facilities like clay courts for tennis, billiard tables, and squash options will excite the ones who like intense physical activity. This is a five star deluxe hotel which lies near the Bangalore International Exhibition Center. The fitness centre in this resort offers services like state of the art equipment for gymnastics, physiotherapy, personal fitness training, health/fitness assessment, exercise studio for aerobics and workout programs and an outdoor pool for volleyball and aqua aerobics. The health club offers biological and non toxic treatments; and these treatment measures are related to some aspects of Eastern medicine. The room and suites are individually equipped with air conditioning, in room safety vaults, direct dial telephones; color television sets (satellite connection), coffee/tea makers, mini bars, and shaving outlets with 220 volt supply, luxurious bathroom fittings, fire protection accessories, and facilities for physically challenged guests. The Moorish Casitas design of the hotel compliments its Mediterranean flavor and enchants its guests. The well appointed deluxe and superior rooms offer an exhilarating view of the gorgeous gardens from their balconies. There are around 16 deluxe suites or two exquisite presidential suites called Tipu Sultan and Puranaiya that overlook the swimming pool and personal gardens. The Presidential Suite is twice the size of the other suites. The Golden Palms Hotel is located only about six kilometers away from the Bangalore International Exhibition Center on the outskirts of Bangalore. The hotel is located around 25 km from the heart of the city and 50 km away from the airport. The special honeymoon package deluxe rooms cost INR 11000 and deluxe suites cost around INR 21000. Visit the multi facility spa that offers international equipment such as dry floatation baths, hydro baths, Jacuzzis, Vichy showers, Turkish hamams, along with a fully equipped gymnasium, a special aerobics floor, and an exclusive gymnasium for women. Sports facilities provided include the swimming pool, jogging tracks, two tennis courts (both outdoors with clay surface), and indoor options like billiards, snooker and American pool tables and two squash courts. The Café Solaire, The Hidden Dragon and Badsha offer a range of exotic and local flavors when it comes to food options. The Studio Lounge Bar is a pub with a large plasma screen playing all Bollywood and Hollywood flicks and you can chill and let your hair down here. The Spa Bar offers special drinks after a rejuvenating session at the spa, and you can check this out. Visit the Aqua Bar, a place that’s famous for churning out beers, fine liquor and other cocktails. Golden Palms Spa offers full massages classified into categories like Swedish Spirit, Balinese Massage, Aromatic Body Bliss and Palms Ayurveda.